Our Membership department is pleased to announce another reciprocal museum benefit for our members. 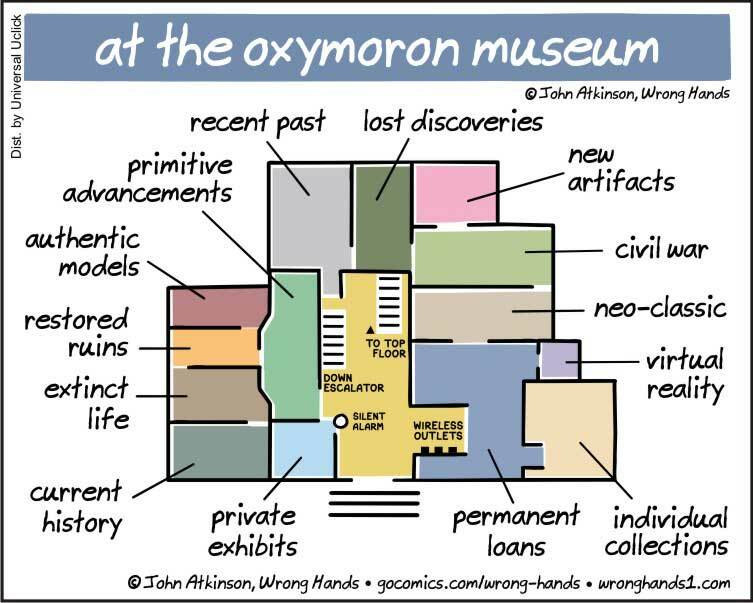 All members will now receive admission to the Oxymoron Museum. This museum is brilliantly curated by its director, John Atkinson, who has organized its collections with unusual rigor. Welcome to the Museum of Folly (MoFo), the world's largest museum devoted to the art of foolishness. Our collection comprises more than 2,600,000 objects, and new works are added irregularly. The objects in our collection date from classical times to the present and include works from all corners of the globe. Highlights of the collection range from the wineskin from which the ancient Greek philospher Silenus drank before being ridden like a donkey by his beloved to a shiny computer on which John McCain proved unable to locate the internet without assistance, and from a jar of lice collected by the Zen teacher Ryokwan to an assemblage of custard pies that were prepared for Mack Sennett but never flung. Having outgrown its previous quarters in the basement of the Civic Center parking garage, the Museum of Folly is delighted to be nearly ready to reopen in a grand new building designed by the acclaimned architect Louis F. St.-Glinglin. Much of the building remains under construction at this time, and only a limited number of galleries are open, wherein objects are on display in new nonglare plexiglass cases -- we are offering limited special access at this time for select donors connoisseurs who wish a sneak peak at coming attractions. To fully benefit from the museum's displays, we recommend that you begin anywhere and wander as you wish. Follow MoFo on twitter at twitter.com/follymuseum. Some rights reserved 2019 museum of folly. This work is licensed under a Creative Commons (attribution, noncommercial, no derivs: 3.0) License (US), although some of the work this blog incorporates may be separately licensed. Text and images by Thomas Christensen unless otherwise noted.